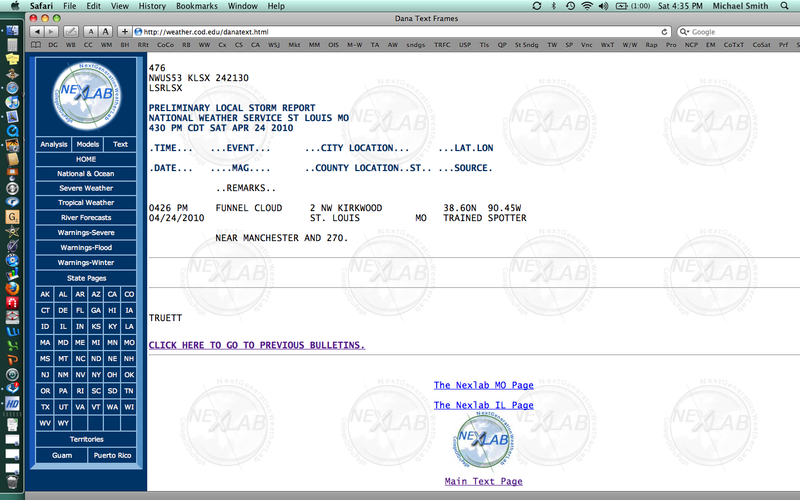 According to CNN, three people have been killed this evening in Arkansas tornadoes. 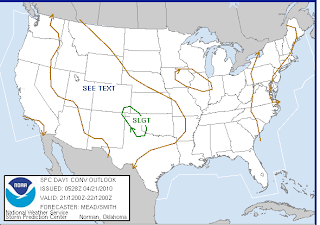 There is a risk of overnight tornadoes, some of which may be strong, in the stippled area on the map. 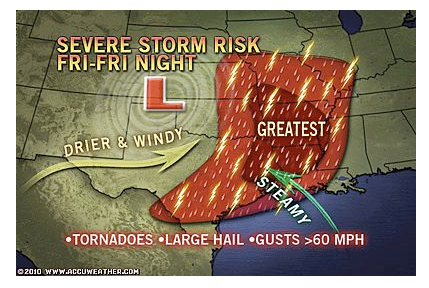 If you live in those areas, especially in Arkansas, keep up with the weather the next few hours. 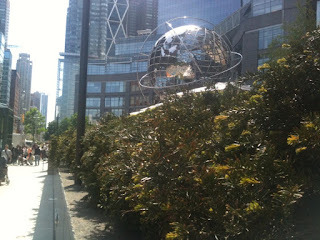 Kim and I are in The Big Apple after a train trip in from Harrisburg. Train is such a relaxing and pleasant way to travel, although Kim would like Amtrak to smooth out the tracks in Pennsylvania. While on the train, the Kansas City Star did an interview about the book. So, we are in NYC and enjoying gorgeous spring weather. Stay tuned for more book tour updates. 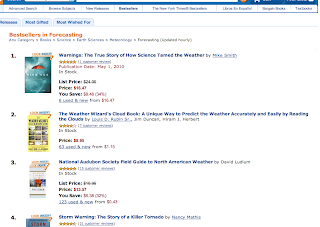 And, at this moment, Warnings is the #1 book in the "forecasting" category at Amazon. Thank you for your support! 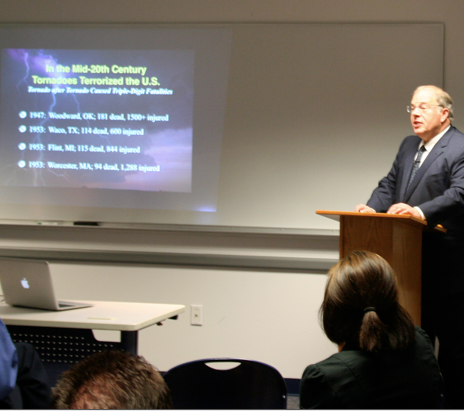 Two speeches, taping with AccuWeather, and interviews with USA Today, The Houston Chronicle and Philadelphia Inquirer. "I'll Believe Its a Crisis When the People Telling Me its a Crisis Start Acting Like its a Crisis"
Al Gore and Tipper: The couple spent $8,875,000 on an ocean-view villa on 1.5 acres with a swimming pool, spa and fountains, a real estate source familiar with the deal confirms. The Italian-style house has six fireplaces, five bedrooms and nine bathrooms. I agree. Steve Hawking says trying to contact beings in outer space is foolish because they might not be friendly. I have a more practical concern: We have been at this for 50 years with nothing to show for it. How many dollars are we going to continue to drop down this metaphorical black hole? I will be appearing with Gregg Jarrett on Fox News Weekend this Saturday (May 1) at 5:45 Eastern, 4:45pm Central. The Book Tour is Here! Kim and I are winging our way east. 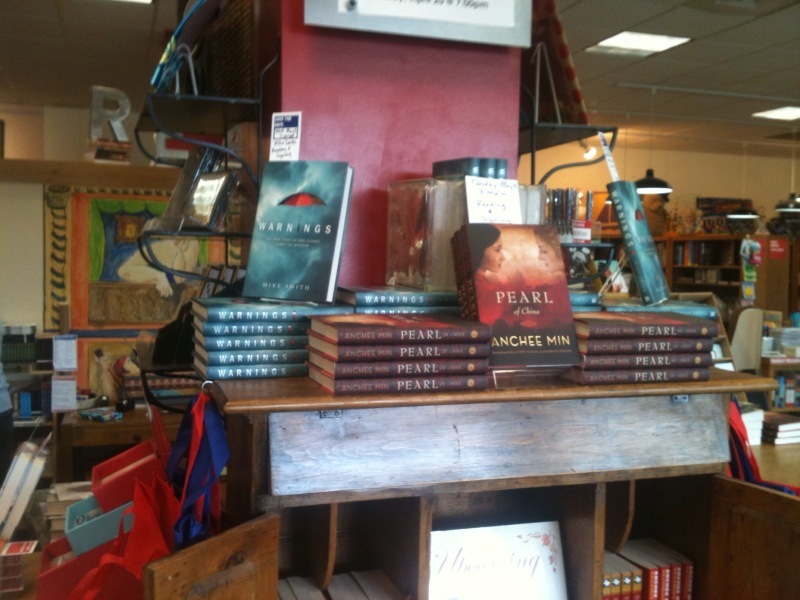 It is day one of the book tour. Stay tuned for updates! With the book signings and various public appearances over the next month, I thought I would post a photo of Kim and me, taken last week, when my friend Britt Fulmer hosted a reception and book signing at his Gentry Limited. If you attend one of the functions, please introduce yourself and let us know you read the blog. The United Nation's environment ambassador is building a 20,000 sq. ft. house. Still, for the first time in years, Apple seems to be gaining credibility with many environmentalists—particularly those who agree that it's time corporations be measured on accomplishments rather than plans. "It's been so much about setting lofty targets and putting out fancy reports," says Michel W. Gillenwater, a climate-change researcher at Princeton University. Or, as Jobs puts it: "All of this stuff is only important for the world if you actually do it. Promises can be very hollow." After not using his private jet much on Apple business during the second half of 2008, Steve Jobs is flying again. So that my position is clear, I do not begrudge anyone from flying private jets (wish I could afford to do so) or building mansions. What I dislike is the hypocrisy of telling us how we should live our lives when they are not willing to apply those principles to themselves. 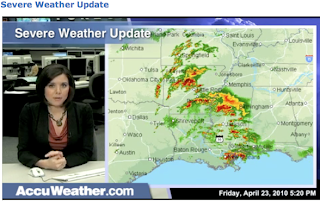 This week is the sixth month anniversary of meteorological musings. Thanks so much for reading and for all of your comments and emails. I have had a few questions about the "cast of characters," the people I routinely name in the blog. I had planned to post photos to acquaint our newer readers with all people who help make all of this happen, but today was absolutely nuts getting ready for the book tour. How nuts? Less than 30 minutes ago I had a TV crew in my back yard taping a report about natural hazards warning systems. So, when I get a little break in the action, I owe you the background information. Hold me to it. This is from opinionjournal.com . It is so good that I reproduce it in full. In 1997, sheep hunters discovered a 4,300-year-old dart shaft in caribou dung that had become exposed as the ice receded. . . . [Archaeologist Tom] Andrews and his team (including members of the indigenous Shutaot'ine or Mountain Dene) have found 2,400-year-old spear throwing tools, a 1000-year-old ground squirrel snare, and bows and arrows dating back 850 years. This kind of misses the big picture, doesn't it? "Global warming" is supposed to be responsible for thawing all these tools, but in order for them to have been frozen in the first place, it has to have been warmer than today 850, 1,000, 2,400 and 4,300 years ago. Maybe they'll unfreeze a lot full of sport-utility vehicles to explain the global warming then. I have always wondered why it is Washington, D.C.? It seems redundant since the City of Washington is the only city in the District of Columbia. Turns out, it wasn't always that way. 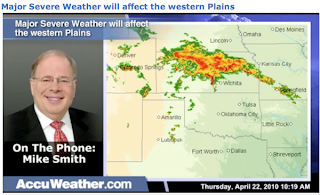 Phil Ruffin is our landlord at WeatherData. He is the owner of the Bank of America Building and we office on its seventh floor. 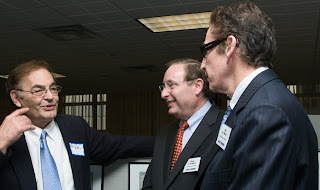 Phil Ruffin at WeatherData's recent open house for our new offices in the Bank of America Building. Pictured with Phil is Barry Myers (center), CEO of AccuWeather, and Joel Myers (right), its Founder and Chairman. Photo by Robin Lorenson. Phil is the embodiment of the American dream. A self-made man who created a sequence of ever-bigger companies and, with them, more and more jobs. I have always found him to be a good person to do business. The Wichita Eagle has a major article about him, complete with additional video and other online coverage. Yes, that is a personal check for more than $171-million dollars made out to the U.S. Treasury. We need more successes like Phil's if we are going to put people back to work and fix our nation's problems with the deficit. Conflicts of interest abound along with a potential organized climate crime connection in this non-investigation into Climategate. Take it away, Tom Fuller. These sorts of conflicts of interest are occurring in the United States, as well. This giant tornado did not look like a typical tornado as indicated in this video and this video. When you combine the unconventional appearance with rain wrapping around the tornado (making it difficult to discern at close distances), the value of the warnings becomes even clearer. 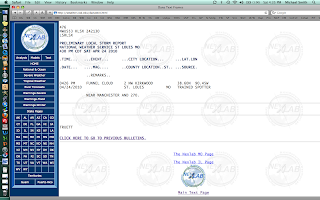 And, why travelers should keep up on the weather when in a tornado watch. The tornado was on the ground continuously for at least 97 miles. The survey of the entire 180 mile damage path is still in progress. UPDATE: From the NWS. This was a very, very rare occurrence. With a continuous damage path and width of this nature, this was the type of tornado that used to kill hundreds. UPDATE II: This tornado appears to be in the top six tornado path lengths since we started keeping those statistics. The monster tornado approaching Yazoo City. Used with permission. The ten deaths from Saturday’s tornadoes are tragedy: For the familes, the friends, and for their communities. Children are left without parents and the parents of the three deceased children are heartbroken the rest of their lives. But there is a silver lining: Without the warnings, Saturday’s tornado death toll would likely have been in the hundreds. There were 55 tornadoes in seven states, including one that caused considerable damage in the St. Louis area. Each of these had the potential to cause death or injury. There was one serious injury with the victim suffering multiple fractures, but there were no fatalities and none of the injuries seemed to be life threatening. “That is one miracle in itself with all the destruction we’ve encountered here in Albertville,” Lyons said. Jean Oswalt, mother of Houston Astros pitcher Roy Oswalt, said she grabbed her dog and took cover in a closet at the last second before the house collapsed around her. She escaped without a scratch. She considers it to be a miracle that she walked away from this kind of damage. “It’s a miracle of God. He brought me through that," Thrasher said. While I cannot comment on Divine Intervention, I can say this: Many of these accounts talk about how the people involved sought shelter before the tornado arrived. If there is a 'miracle' involved in that, it is a miracle of science: The United States' amazing, and unique, storm warning system. According to Misssissippi Governor Haley Barbour, the border-to-border tornado in his state caused “utter obliteration.” Similar to the Woodward, OK Tornado of 1947 that killed 181, the ten deaths from the Mississippi tornado is an incredibly low number. Credit the warning system. If you page down through my posts of the last few days, you learn that on Thursday the danger of a Saturday tornado outbreak was highlighted. 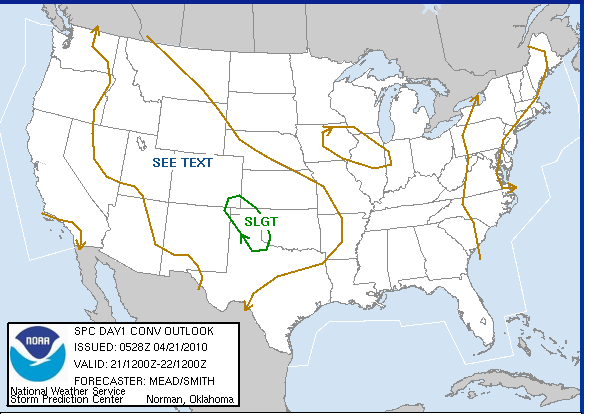 On Friday, meteorologists were forecasting that Saturday would be the worst day of the four-day period of tornadoes. 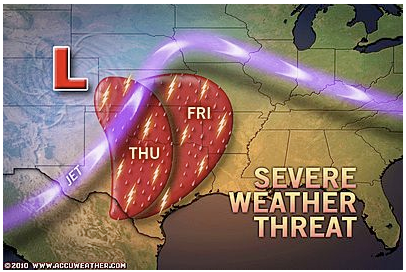 AccuWeather.com made this forecast as did the NWS's Storm Prediction Center. By Saturday morning, every radio and television station in the region was broadcasting the “high risk” of tornadoes. I even heard it on Sirius Satellite Radio around 9 am on a music channel that doesn’t carry news. The Storm Prediction Center issued “particularly dangerous situation” tornado watches well ahead of the storms, with the PDS tornado watch for northeast Louisiana and Mississippi issued at 6 am and reiterated at 11:30am. So, when the giant Mississippi tornado began its 180-mile long, one mile wide, path of destruction near Tullulah, LA, at 11:14am, people were prepared when the storm sirens began to blow. Doppler radar (which I call in Warnings one of the best investments the federal government has ever made) tracked the tornado’s path. As it approached Yazoo City, the signature was unmistakable. Strongly-worded, pinpoint warnings were issued by the National Weather Service. At left, the Doppler wind display showing the maximum values when the tornado was over Yazoo City. At right, the pink oval southeast of Yazoo City is the debris carried aloft by the tornado. We knew a major tornado was in progress. What was at first an exciting day quickly transitioned into a sobering experience for a lot of storm chasers in Mississippi yesterday. Jesse Risley, Brad Goddard, Kevin Crawmer, Joel Taylor, Reed Timmer, Chris Chittick and many others are nothing short of heroes. They were the first on the Yahoo City, MS aftermath scene and rescued several people from their homes by digging through debris to get to them and keeping them alive until EMS arrived. 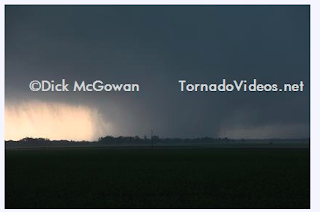 The storm chasing community should be extremely proud of these individuals for their efforts. Saturday’s tornado death toll, without the warning system, likely would have been in triple-digits. Meteorologists did their job well and storm chasers were heroes. Congratulations to the meteorological profession on another job very well done. In an earlier posting, I said I would present pictures of the 55 ft. tornado that was to be dedicated in Catoosa, Oklahoma, yesterday as a memorial to a tornado that occurred in 1993. A promise is a promise. Here is a time lapse video tape of it in action. To me, it is in terrible taste, which is why I am not showing a photograph. Click on the above link if you want to see it. 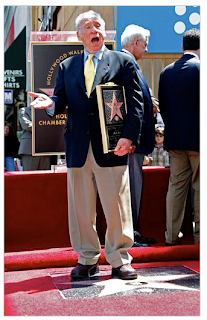 Mel Brooks is Finally a "Star"
I would have assumed Mel already had his star on the Hollywood Walk of Fame. May your star "blaze" for years to come and "produce" much joy and pride. Second UPDATE: Some scattered damage, but no major injuries reported in St. Louis. 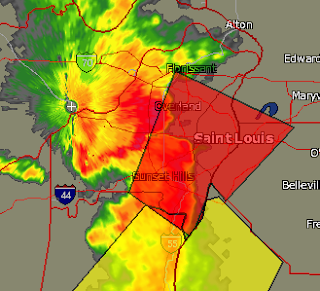 UPDATE: Tornado touchdown reported at West County Mall in St. Louis County. A tornado or, more likely, a "family" of tornadoes (multiple tornadoes from the same parent thunderstorm) which began in northeast Louisiana near Tallulah and moved across Yazoo City is about to cross the border into Alabama! The image below from 2:24pm Central time, shows the location of the tornado as the whitish circle just north of West Point, MS. The tornado warnings (purple polygons) are along the Alabama border. 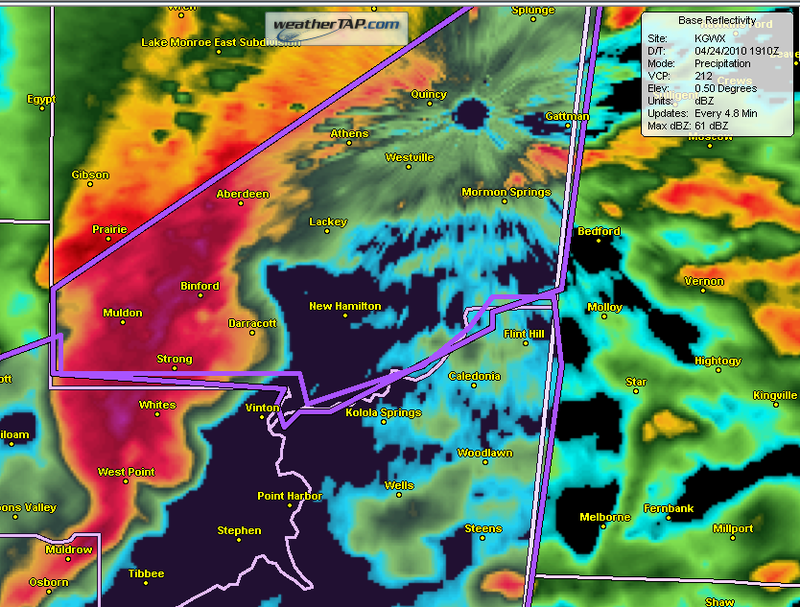 The east side of Yazoo City is reported to be "gone" as a strong tornado moved across the area. We do know there are injuries, but the extent is unknown. 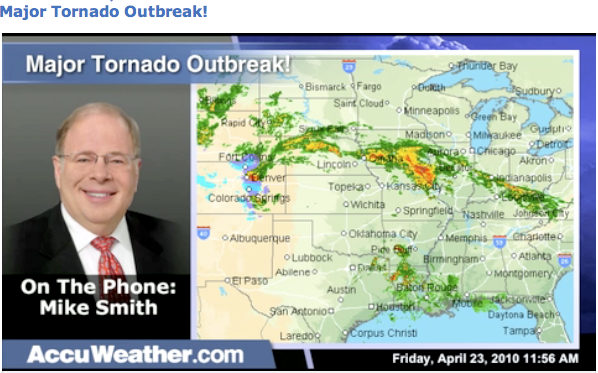 This is a major tornado outbreak. 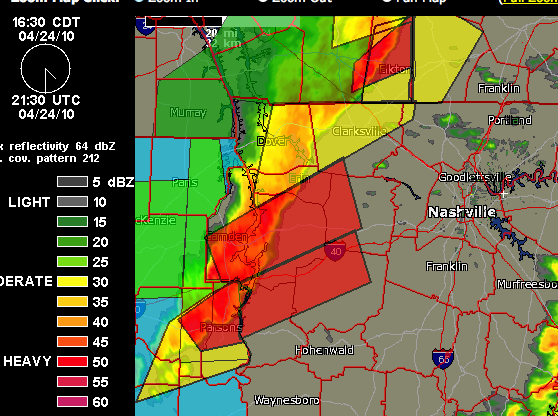 The two tornado watches are "particularly dangerous situation" watches -- rare, indicating the potential for strong, long-lived tornadoes. If you live in these areas please stay up-to-date on the weather. Also, look at the post below for the larger threat area that extends into tonight. AccuWeather has detailed rundown of the damage here. 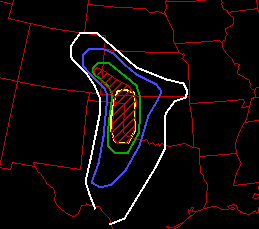 These are the latest (11:34am) tornado probabilities. Everyone within the blue line should keep an eye on the weather. 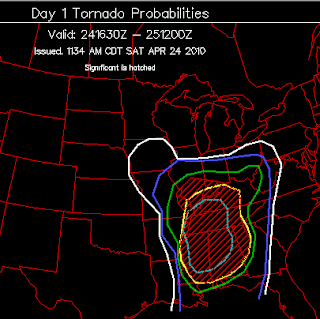 If you are in the red hatching, you are in an area where violent tornadoes are possible. Please keep up on the weather today in those areas! While the tornado warning system is a magnificent scientific achievement that saves about a thousand lives a year, there is only so much it can do. One of the things that keeps meteorologists up at night is a tornado hitting a NASCAR track or sports stadium full of people with inadequate shelter. We have the potential of one of those nightmares occurring today at Talladega Motor Speedway. As the photograph from the Anniston Star illustrates, the raceway is filled with tents, motor homes, and trailers. The stands will be filled with tens of thousands of people. There is no way to get everyone to safety if the worst happens. And, it might. 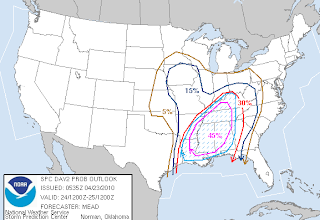 A "high" risk of tornadoes only forecast by NOAA's Storm Prediction Center only once or twice per year. 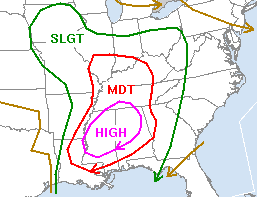 Talladega is located at the east end of today's high risk area. "There's the possibility of severe weather, but there's also the possibility of sunshine," Hunter said. That quote seems to have a "whistling past the graveyard" quality to it. Let's hope nothing serious occurs. Last night, Kathleen and I saw "Date Night," the new Steve Carrell/Tina Fey movie. Both of us really enjoyed it. The writers obviously were people who had children and had been married a while. Two thumbs up! As a Rotarian, I have a keen interest in the fight against polio. 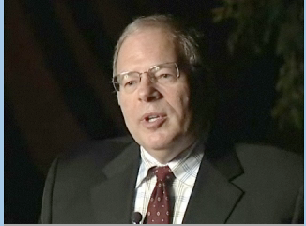 Rotary International for many years, has lead the fight to eradicate polio. 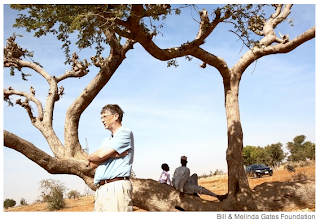 Recently, the Gates Foundation has teamed with Rotary in the fight. Details here. The Wall Street Journal has an interesting and comprehensive article about Bill Gates' work in this complicated effort. The link is here. (subscription may be required) This type of excellent reporting is why I read the Journal. The scientific, logistical, and cultural challenges are immense but the payoff is worth the effort. 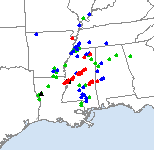 With several tornado touchdowns already reported, more tornadoes will occur overnight in the southern threat area. In the northern threat area, the probability of tornadoes will diminish starting around sunset. Kate Bilo and I have more here. 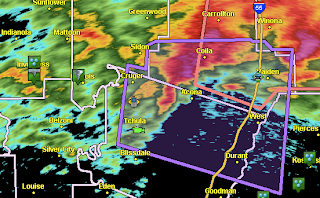 Hook echo with potential tornado (tornado warning in purple) approaching Acona, MS at 5:29pm. I would like to thank my friends at KWCH TV, and especially meteorologist Mark Larson, for a great interview this morning. It can be viewed here. 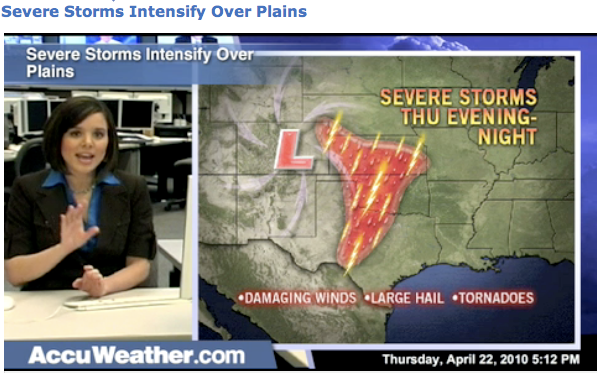 Kate Bilo and I talk about the tornado potential for today through tomorrow at this link to AccuWeather.com . UPDATE: There were 34 tornadoes in four states yesterday (photographs and accounts here ) without a single injury or fatality. 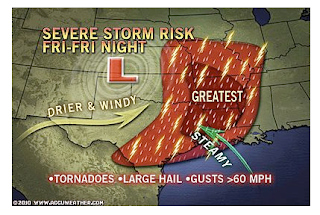 That is America's amazing storm warning system at work. This interview with Judy Curry (a mainstream climate scientist) is excellent. Highly recommended. 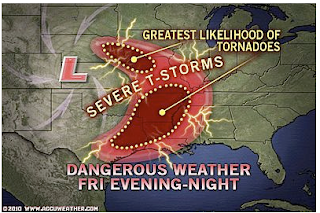 An outbreak of tornadoes is possible in the area indicated above with violent tornadoes possible in the area marked "greatest" threat. AccuWeather has details here. 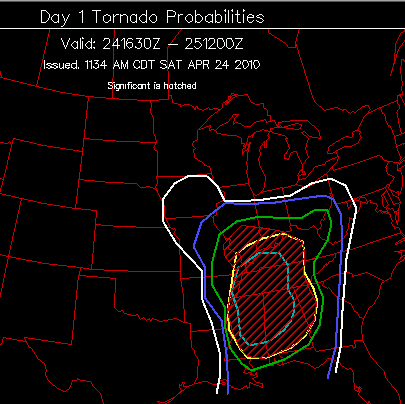 More violent tornadoes are possible tomorrow. If you live in the area outlined in the blue hatching, be especially vigilant. The early reception to Warnings has been wonderful, better than I expected. 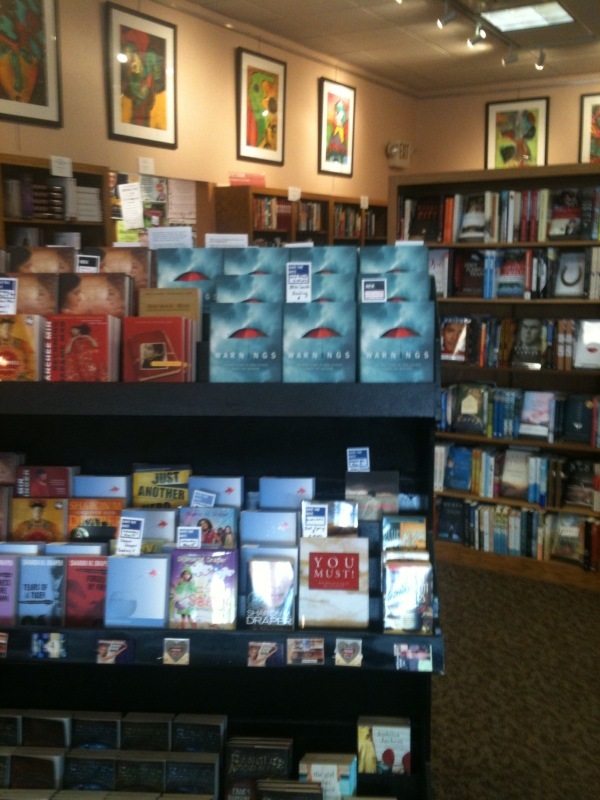 I want to give a special thank you to the independent book stores like The Bookworm in Omaha, Rainy Day Books in Fairway (Kansas City), and Wichita's own Watermark Books who are stocking and supporting Warnings. Watermark has been especially supportive, and I really appreciate it! My first public book signing is Wednesday, May 5, 7pm at Watermark. Please join us! 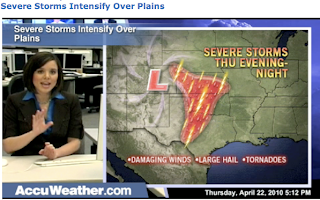 It is not my intention to blog about every severe weather situation. However, I am making an exception because the 2010 tornado season is "restarting" today and people may be out of the habit of keeping up with the weather. 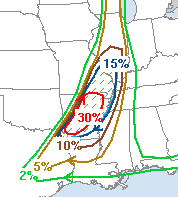 If you live in the area enclosed by the blue line there is a chance of tornadoes the rest of this afternoon and tonight (the latter especially true in south central Kansas and north central Oklahoma. Please listen for watches and warnings. 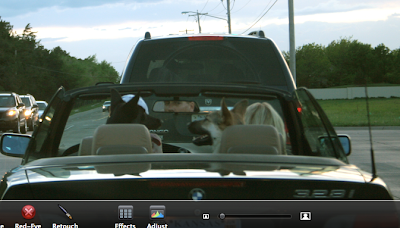 I'll be doing a special report with my State College AccuWeather colleagues and I'll post a link when it is ready. The next three days (now through Sunday morning) will feature the highest threat for tornadoes and severe thunderstorms thus far in 2010. For a video discussion, click here. Richard is the Alfred Sloan Professor of Meteorology at MIT. His Earth Day letter is here. Click here to see the entire interview. Thanks again, Mike Thompson! This field was burned eight days before. In just that amount of time, new prairie grass is already appearing. There may tornadoes and severe thunderstorms over a larger geographic area both Thursday and Friday. Please pay attention to the weather the next few days if you live in these areas. 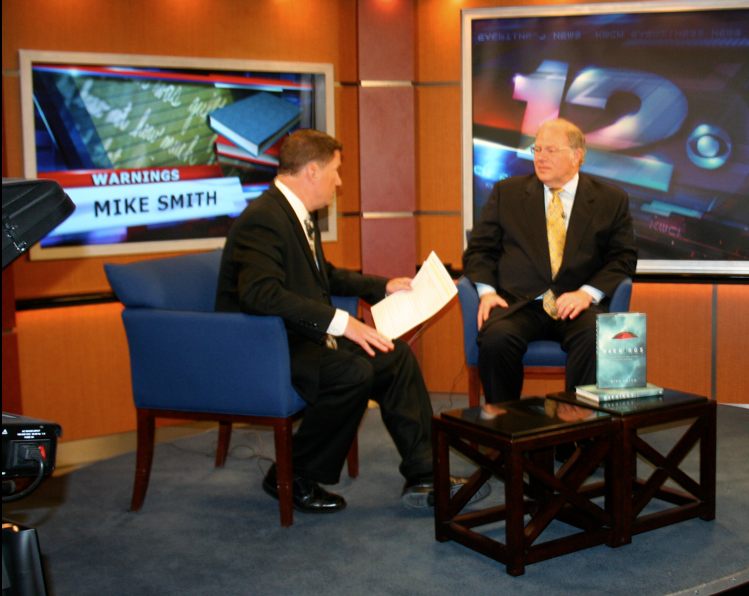 Thank you to to Mike Thompson for for the interview this afternoon. WDAF TV was the station I was watching during the Ruskin Heights Tornado. They accurately relayed Joe Audsley's warnings of the storm. 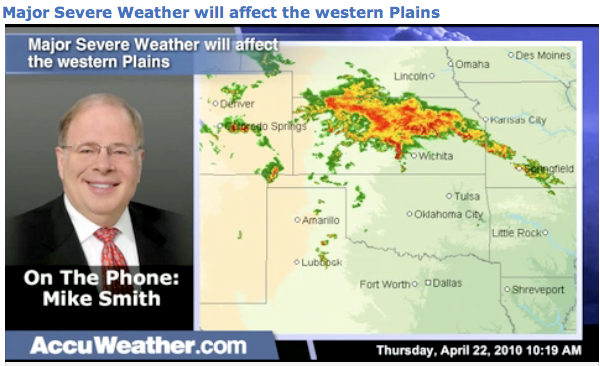 Like me, Mike Thompson started his television meteorology career in Oklahoma City. 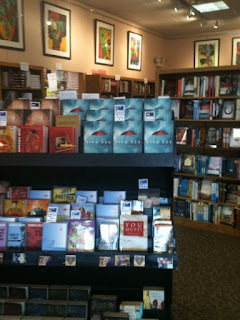 Checking out the shelves at a local bookstore. 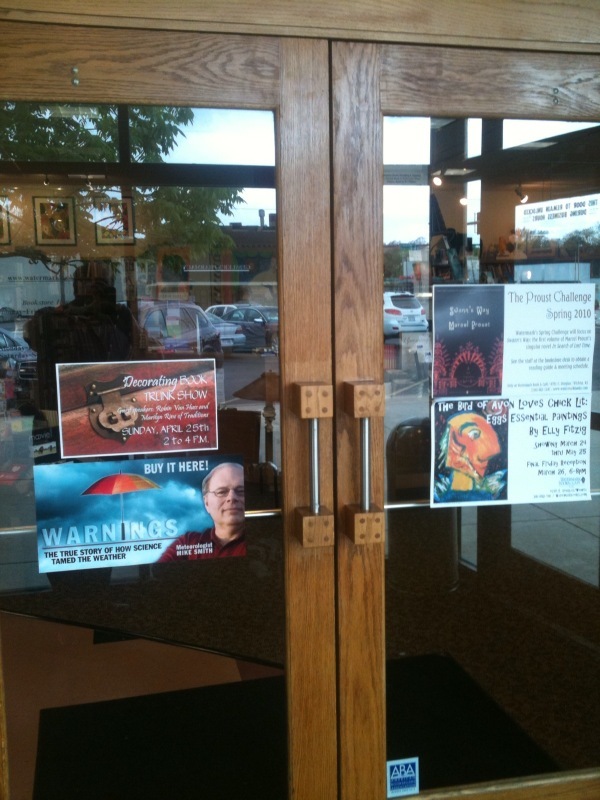 Warnings is in good company. 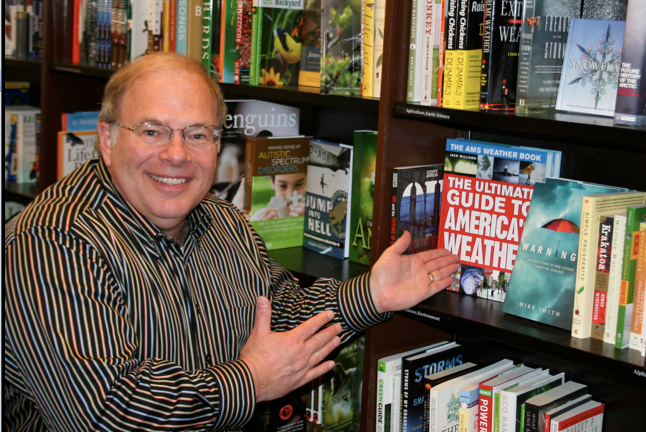 The American Meteorological Society's Ultimate Guide is an excellent book. Taken yesterday (19th). 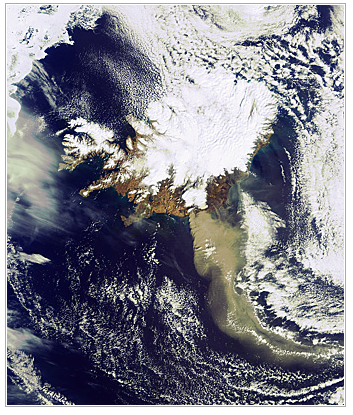 Note how most of Iceland is not experiencing the plume. Note also the densest ash is flowing over the ocean. When a Sierra or Cascade volcano erupts in the U.S., the densest ash will affect a populated area. 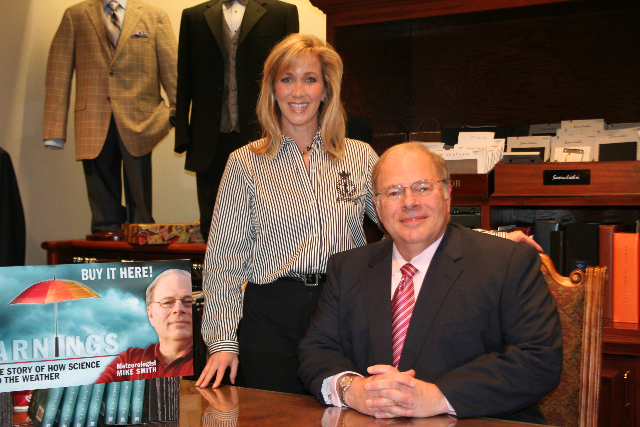 Kim and I will be on the road later this morning for two media interviews in Kansas City later in the day. Stay tuned for more information. Global Warming -- Is There Anything It Can't Do? So, let me get this straight: Europe has the coldest winter in 50+ years, so 'global warming' "triggers" this volcano. There are days that this topic makes me embarrassed to be a scientist. KSN did a great job with the interview this afternoon with regard to the creation of a volcano warning system. You can watch here. Doppler Radar. Is There Anything It Can't Do? Cows Bad! No, Wait, Cows Good! Can You Loan Me A Stick 'A Beemans? 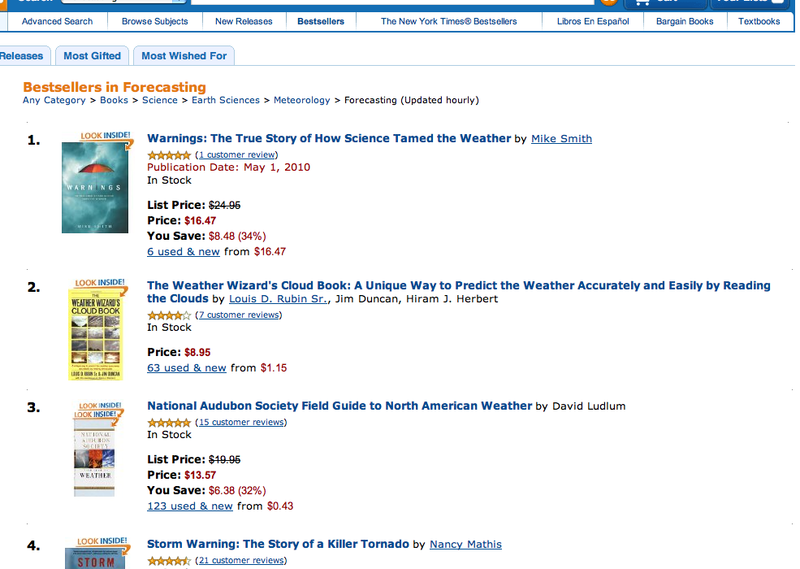 "The Right Stuff" of Weather?